Originally a tight end in college, Brazile was shifted to linebacker with great success, achieving All-conference honors in 1974 and participating in the Senior Bowl. Jackson State won back-to-back SWAC championships in 1972 and ’73. 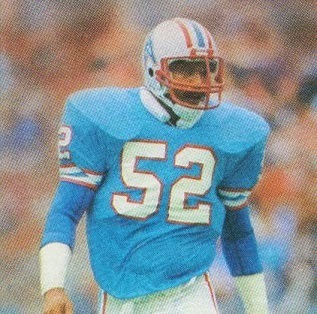 The Oilers chose Brazile in the first round of the 1975 NFL dratt (sixth overall, and the first linebacker taken), and proved to be a good fit on the outside as new Head Coach Bum Phillips shifted to a 3-4 defense. Oilers went 10-4 to finish third in the AFC Central while leading the conference in fewest rushing yards allowed (1680). It was the team’s first winning record since 1967. “Dr. Doom” followed up his outstanding rookie season by gaining selection to the Pro Bowl for the first of seven straight years in 1976. A hard hitter with great range, he was highly effective as a pass rusher. He didn’t miss a game in his ten-year career, appearing in a total of 147 regular season contests and seven in the postseason. In addition to his Pro Bowl selections, he was a consensus first-team All-NFL selection twice, in 1978 and ’79, and received all-league or all-conference honors after five other seasons. While sacks were not an official statistic during his prime years, he was unofficially credited with 48 (officially he had 11 in his final three seasons) and the team also credited him with 1281 tackles. Brazile also intercepted 13 passes and recovered 14 fumbles. Rookie of the Year Profiles feature players who were named Rookie of the Year in the NFL (including NFC/AFC), AFL (1960-69), or USFL (1983-85) by a recognized organization (Associated Press – Offense or Defense, Newspaper Enterprise Association, United Press International, The Sporting News, or the league itself – Pepsi NFL Rookie of the Year).